Comrade Kim Jong Il was born the son of guerrillas on February 16th 1942. Our delegation visited his birthplace at Mt Paektu in August 2017 He did not come from a privileged background but was brought up in clothes made from old uniforms and spent his childhood in a simple log cabin. He witnessed the severe anti Japanese war and later as a young boy also witnessed the Fatherland Liberation War against the American imperialist aggressors the sworn enemy of the Korean people. Comrade Kim Jong Il lived a most simple life . As a student he participated in the construction of Pyongyang. He also worked a textile machinery factory at the number 26 lathe. Thus comrade Kim Jong Il was a true people's leader , always with the people sharing both hardship and joy with them. 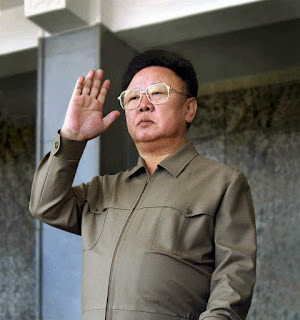 Often comrade Kim Jong Il did not celebrate his own birthday and dressed in an old parka. At the beginning of the 1960s Kim Jong Il gave guidance to the historic Seoul Ryu Kyong Su 105 Guards Tank Division of the KPA . In June 1964 he started work at the central committee of the Workers' Party of Korea. As well as practical day to day leadership he developed the ideology and theory of the WPK . He systematised the Juche Idea and created Kimilsungism . Because of his skills as theoretician and ideologist plus his modest style as a people's leader he was acclaimed as the successor to the great leader President Kim Il Sung . The great leader comrade Kim Jong Il steered the DPRK through the difficult period of the "arduous march ". 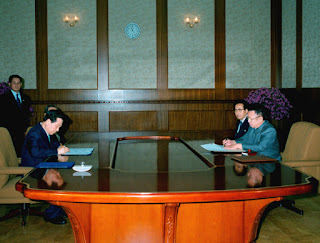 Even though the DPRK faced difficulties he made sure that a high level of social benefits was maintained . Vans with soya milk for children were always seen on the streets of the DPRK in this period. The ideas of the great leader comrade Kim Il Sung on national reunification were thoroughly applied and developed in depth by the great leader comrade Kim Jong Il . He made a decisive breakthrough in the struggle for national reunification by having the June 15 Declaration signed with the then south Korean chief executive Kim Dae Jung in 2000. Declaring "Expect No Change from me!" , comrade Kim Jong Il combated the pressure and machinations of US imperialism . He upheld the banner of Juche further supplemented it with the Songun idea and Songun politics the treasured sword for defending independence. Today the DPRK is the world's most independent country . It is seen as a country that does not take nonsense from any imperialists or big powers . This is the legacy of the great leader comrade Kim Jong Il, a legacy that is today further developed and carried forward by the dear respected Marshal Kim Jong Un , the one and only successor the Juche cause. We joinwith the Korean people and world progressives in commemorating the great leader generalissimo Kim Jong Il on the 77th anniversary of his birth . The Myth of the 'Slave Camps"
SOME LIES FROM BBC TURKEY REFUTED.